The HTL Series is an all in one solution to control a 12 or 24 VDC motor when only 115 or 230 VAC is available. 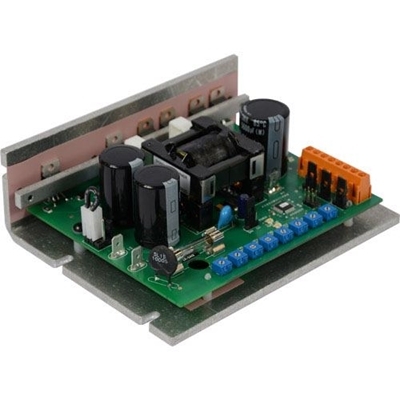 The HTL05-D-4Q design combines an AC to DC switching power supply with a DC drive, allowing exceptional control of a low voltage motor with a high voltage supply. Other controls on the market today use a PWM bus voltage of 165 VDC. As a result, your 12 VDC motor will see 165 VDC spikes that can cause premature motor failure. Our HTL Series instead uses a 14 or 28 VDC PWM bus voltage and as a result you will see increased motor performance and lifespan. Like all of our drives, the HTL Series is designed and manufactured in the United States. The HTL Series drive has all the same features and performance as a high end 90/180 VDC regenerative four quadrant DC drive. This drive allows braking and reversing on the fly with a simple input to the drive. The drive has built in isolation so interfacing to PLC is simplified. The microprocessor on this drive allows the HTL Series to be extremely flexible for OEM applications. The drive contains LEDs for power and current limit status along with calibration trimpots for FWD ACCEL, REV ACCEL, FWD MAX SPD, REV MAX SPD, FWD CURR LIMIT, REV CURR LIMIT, IR COMP, and MIN SPD. All of the above mentioned features can be customized at our factory to meet your OEM needs. Allows use of 115 or 230 VAC supply voltage on 12 or 24 VDC motors. Reverse and/or brake on the fly. Easy interface to a PLC and added safety. Custom programming available for OEMs. LEDs for power and current limit status. Jumpers for: inhibit personality, wig-wag, analog input range, input voltage and output voltage. Switching power supply and DC drive in one package. Trimpot adjustments for FWD ACCEL, REV ACCEL, FWD MAX SPD, REV MAX SPD, FWD CURR LIMIT, REV CURR LIMIT, IR COMP, and MIN SPD. The standard HTL drive can be used with actuators. There is also another version of the HTL drive with I/O designed specifically for actuators.